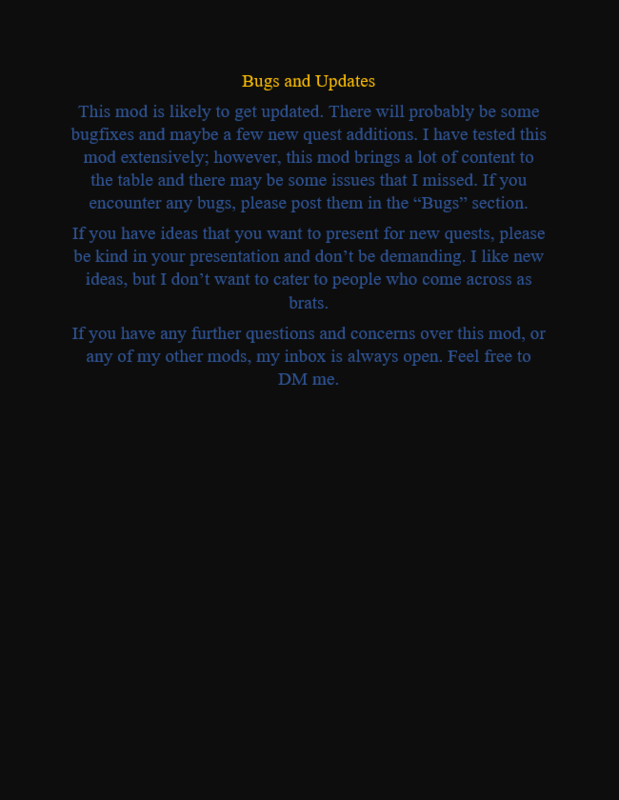 This mod no longer requires DLC! There is no need for separate versions either; you can install DLC later, and it won't care. I usually stream at around 10 PM on week days. Expect me to stream later on weekends, if I stream at all those days. I don't stream every day, and listed stream times are subject to situational change. I highly recommend that you try Warlike﻿﻿, Fallout 4-76﻿ and Camps of the Wasteland﻿ with this mod. This mod comes compatible with Fallout 4-76 out of the box. Fixed a bug that deleted flags and kept the flag quest running despite flag deletion. Fixed a bug that prevented the player from completing artillery crew quests. Now you complete these quests through critically damaging the artillery gun itself. Fixed a bug where the mission scanner did not resume after capturing an area. 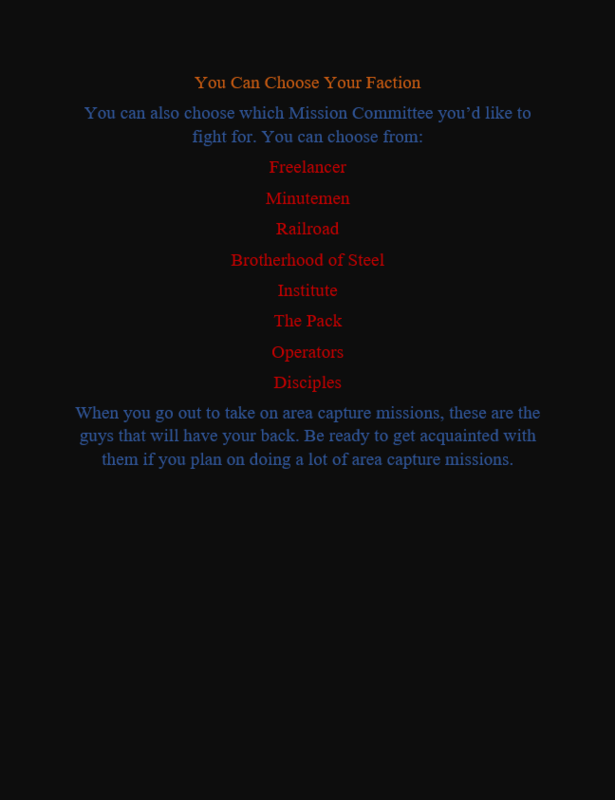 -Made it possible to add custom factions. 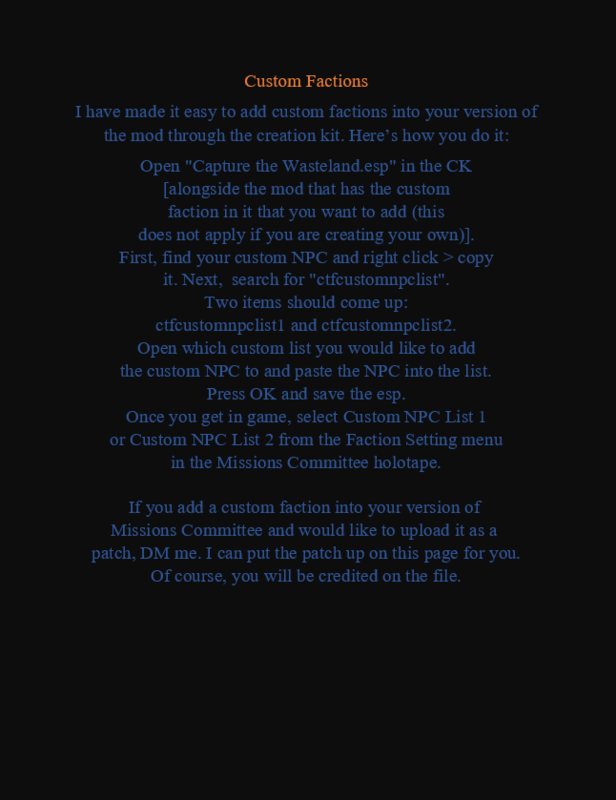 -Completely removed requirements to work with factions. Just beware that if you work with enemy factions, they will try to kill you at mission objectives. 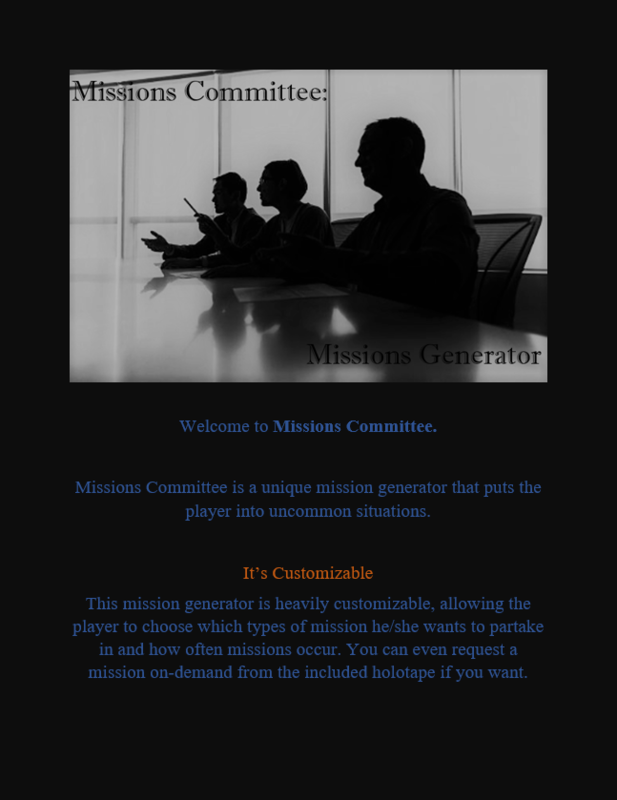 -A button to abandon missions. -A button to disable the mission scanner. -Notifications for all missions now display properly. 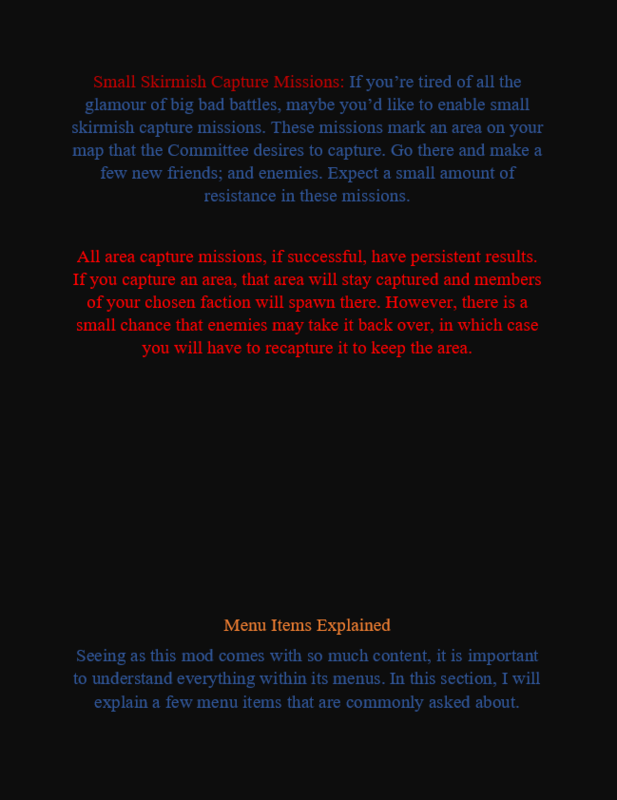 -Defense missions now spawn enemies properly. -"Mission failed; the target escaped" will no longer display over and over again upon failing an elimination mission. -Walking too far away from artillery guns fail artillery missions and restart the mission scanner. -Removed "Activate it to destroy it" from the notification for artillery missions, as that portion of it is outdated information. -Improved object placement; objects will spawn underground less often. -Made textual changes to notifications so information is more clear. -Added an intel system; you can now look at previously shown information notifications regarding missions through the holotape. This new intel system also features huge improvements to mission notifications. 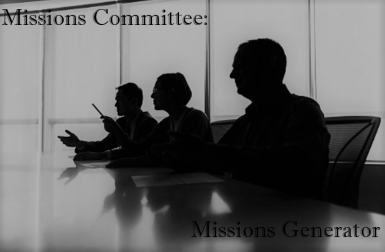 You will now be informed of mission type, enemy type, how many enemies there are, how many teammates are there to help you, and other special information regarding the mission at hand. -Somewhat fixed a bug where switching mission availability to "No" doesn't stop missions from rolling. 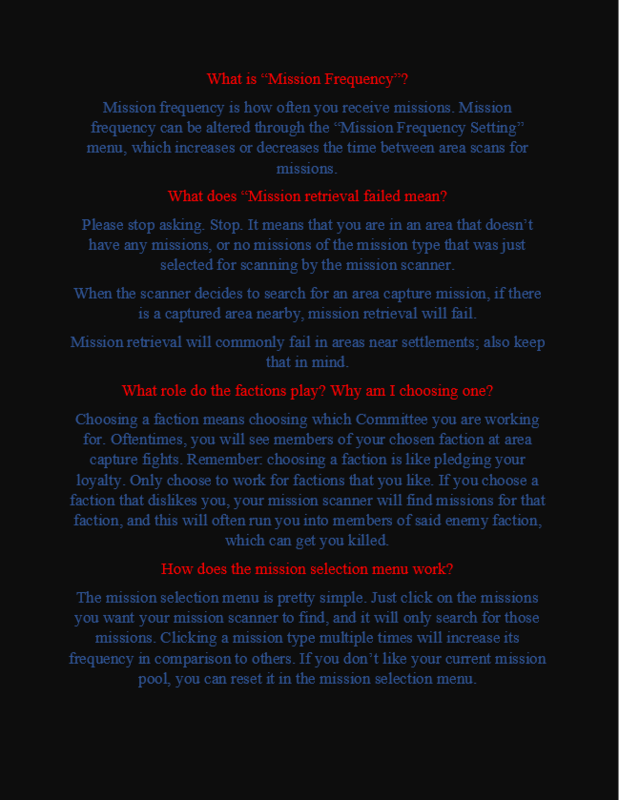 This issue comes from the player switching mission availability to off while in the middle of a mission. The mission scanner starts again automatically after the mission is completed or abandoned. Because of this, I made it so the post-mission auto-scan sets availability back to "Yes." Switching it back to "No" when you aren't currently participating in a mission will keep the mission scanner from firing again until after you set your availability back to "Yes." 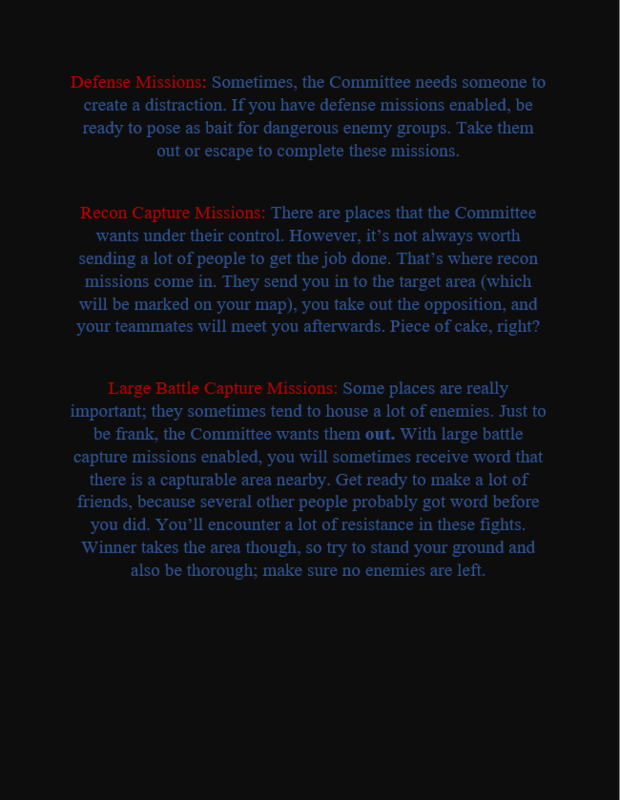 -Changed how spawns at capture missions work. Now, friendlies will not spawn at capture points until you get 4000 units or less away from the flag (so basically, try to get close to it, and this will draw out your friends). That way, it's not like you are just approaching an already ongoing battle. -Made it so that you can complete artillery missions by either killing all the crewmen or destroying the artillery gun, just in case the gun spawns underground. 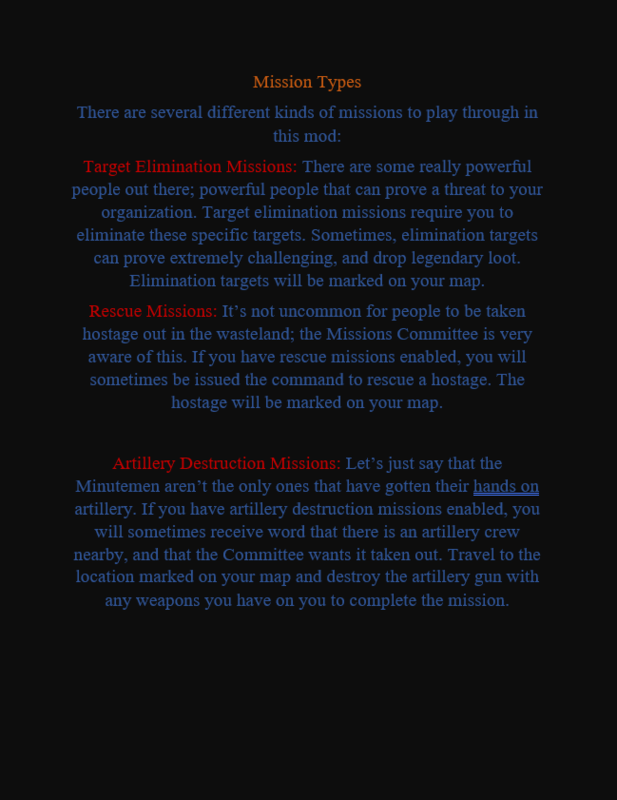 -Changed the mission success message for ambush missions. -Changed how enemy NPCs spawn at capture zones; now they spawn very close to the flag, so it isn't like they are just popping up in your face. -Fixed Operators, Pack, and Disciples teammates not spawning bug.